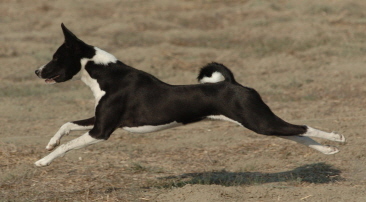 Cole is our second basenji. He comes to us from Dharian Basenjis. 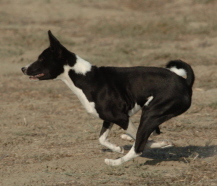 He is very different from our first basenji Cole. Where Cole always want to be the center of attention Levi is more mellow. Levi has also been another learning experience in the ring. He is doing well in show career with 8 points towards his championship and taking 1st in the Open Black and White class at the 2007 BCOA Nationals. Levi's true passion is running. 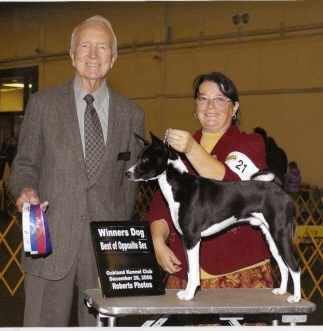 He quickly earned his AKC Field Championship and is working on his ASFA Field Championship. Levi has already earned his Junior Oval Racer title and has 7 points towards his Oval Racing Championship.